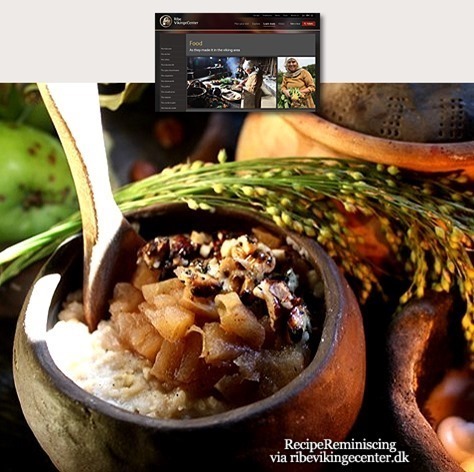 If you want to cook this porridge the authentic way, cook the porridge and stewed apples in earthenware pots set right beside the fire. 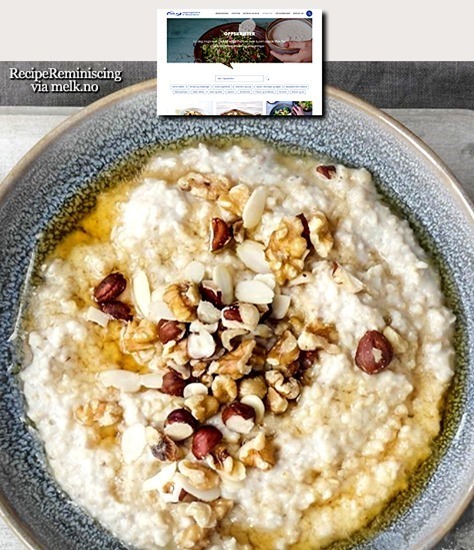 Do remember to stir quite often and turn the pot to prevent the porridge from burning. You can of course make the dish on your kitchen stove as well. A recipe for ale rised bread found on CookIt! Bread was part of the staple diet in Medieval times. And this is a simple risen bread which uses ale (the yeast in the ale) to make the bread rise. The ale is warmed to activate the yeast. 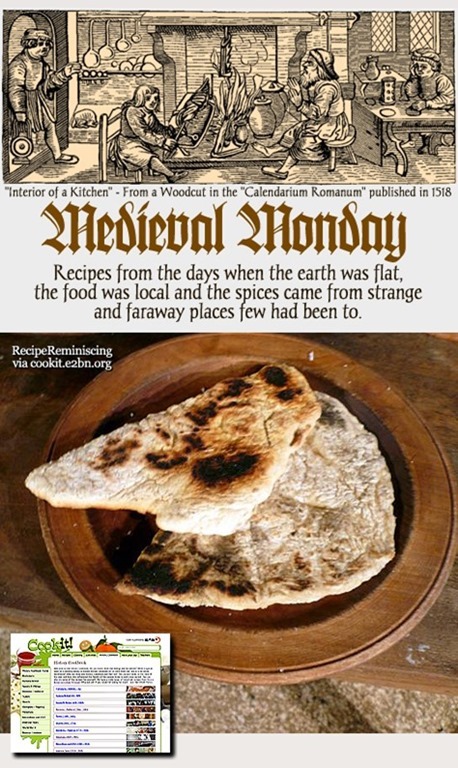 Many early breads and biscuits were baked on flat metal pans, much as earlier peoples had cooked on flat stones. The heat from the griddle cooks the food. 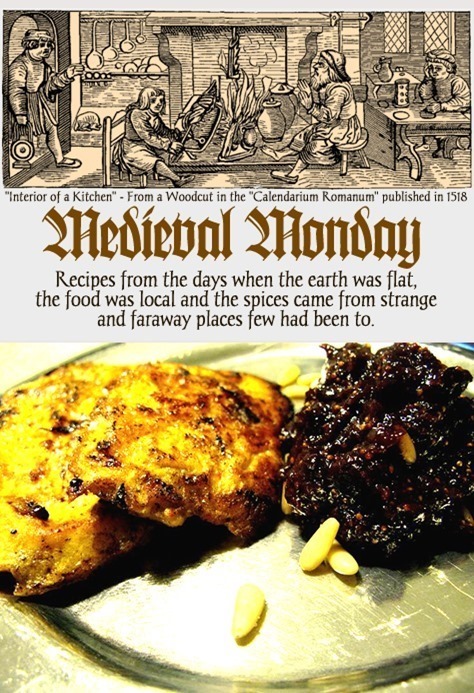 A medieval lunch/dinner recipe found at CookIt! Frumenty was a staple food for thousands of years. The earliest versions were probably made by early farming communities with dried grains. Frumenty was still being commonly referred to in Victorian books, although it had fallen out of favour as a dish by then. 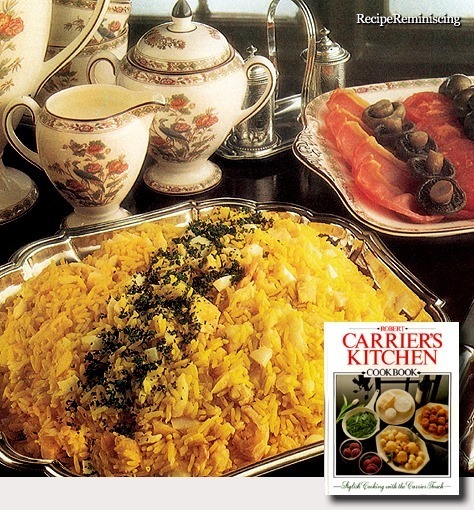 There are many versions of frumenty including a winter dish often served at Christmas. This festival dish was made with milk, eggs, currants and saffron. 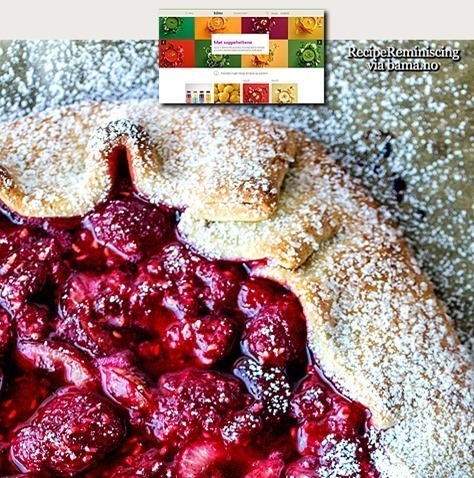 A Stuart era dessert/snack recipe found on CookIt! 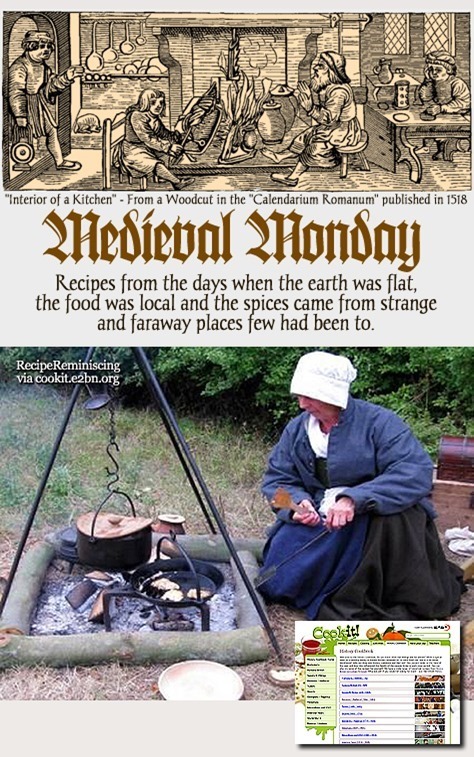 In Stuart times, cooking methods were much as they had been for centuries. Most food was still cooked over open fires, outdoors as much as possible, otherwise the houses became filled with smoke and the danger from fire was much greater. Spit roasts were improved and became easier to use, otherwise trivets for frying and cooking pots for boiling were the main cooking methods. This recipe is simple but nutritious, using eggs and apples, both of which were easily obtained in the countryside where most people still lived. The addition of raisins and ginger (both imported from abroad) were too expensive for most ordinary people, and used sparingly even by the better off. Goulash (Hungarian: gulyás [ˈɡujaːʃ]) is a soup or stew of meat and vegetables, seasoned with paprika and other spices. Originating from the medieval Kingdom of Hungary, goulash is also a popular meal in Central Europe, Eastern Europe, the Netherlands, Belgium, Switzerland, Scandinavia and Southern Europe. 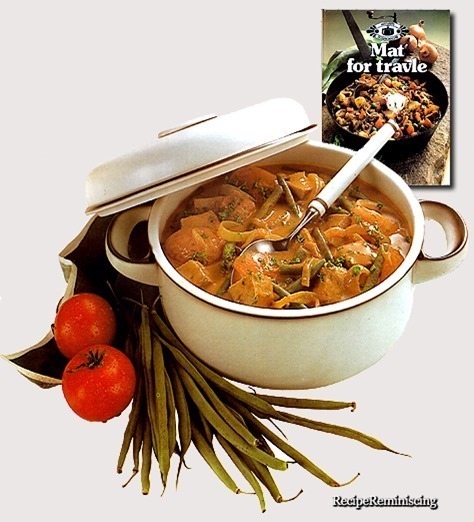 Its origin traces back to the 9th century to stews eaten by Hungarian shepherds. Back then, the cooked and flavored meat was dried with the help of the sun and packed into bags produced from sheep’s stomachs, needing only water to make it into a meal. It is one of the national dishes of Hungary and a symbol of the country. 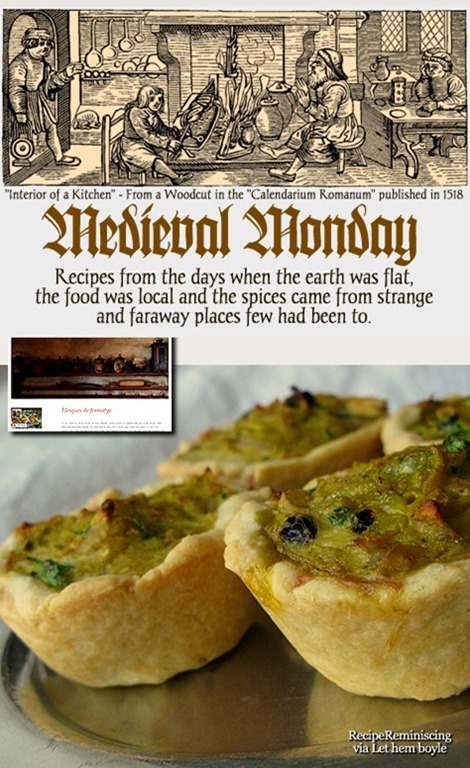 A medieval Roman recipe found on CookIt! This recipe illustrates the Roman love of dishes that could be dipped into sauces. A vast array dishes could be served in bowls and platters. Meat would be carved into small pieces, so that each guest only picks what he needs and dips the meat into the accompanying sauces served in little bowls. The meat would be cooked over a raised brick hearth, on top of which was a charcoal fire. The meat was placed in a pan on a tripod placed over the fire or cooked directly on a grid. Also used were frying pans (pensa), deeper pans (patella and patina), mixing bowls (mortaria) with a spout for pouring. The recipe given here is not meant to be cooked in a modern kitchen but on an open fire or on a charcoal grill. Roman cooks judged quantities by eye so measurements are not given. Apicius provides the ingredients for the sauce, this then accompanies pan- fried meat. 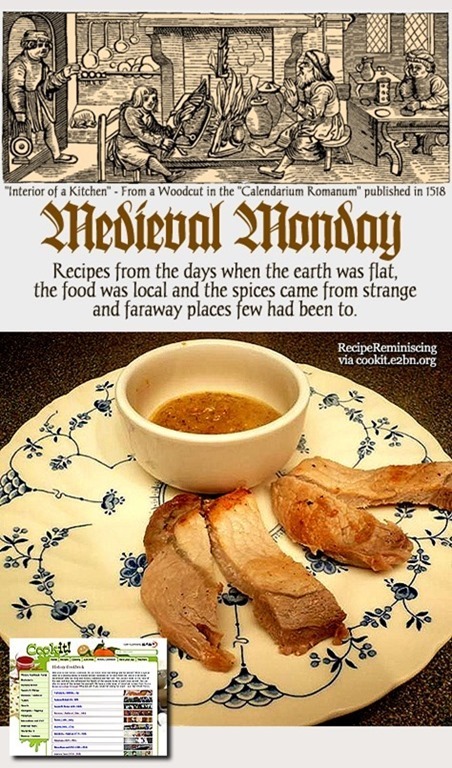 Stephanie Ann Farra who runs ‘World Turn’d Upside Down’ writes: This recipe was cooked for the Historical Food Fortnightly. 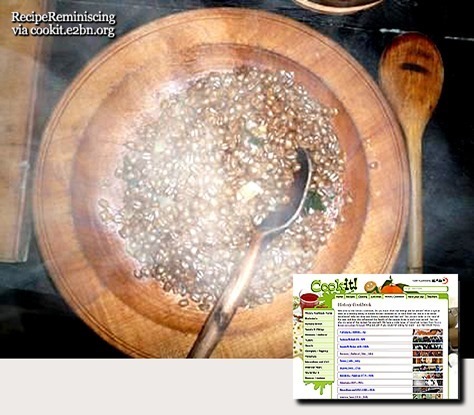 A yearly challenge that encourages bloggers to cook a historical food every two weeks. For this challenge I decided to take on a lemonade twist with pineappleade. 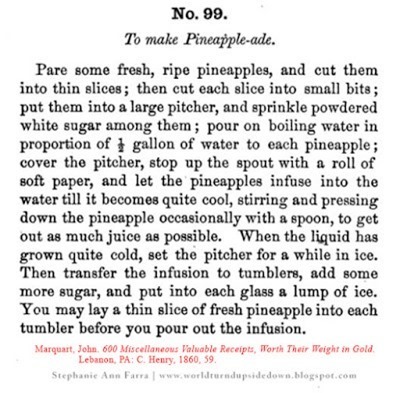 Pineapples were exotic fruits in the 1800s, mostly grown in Jamaica. They were used for such dishes as ice cream, pudding, pineapple chips, fritters, drinks and marmalade. They were considered a “dessert” fruit and was often paired with sugar. Pineapples, being imports, were not as common as home grown fruits. 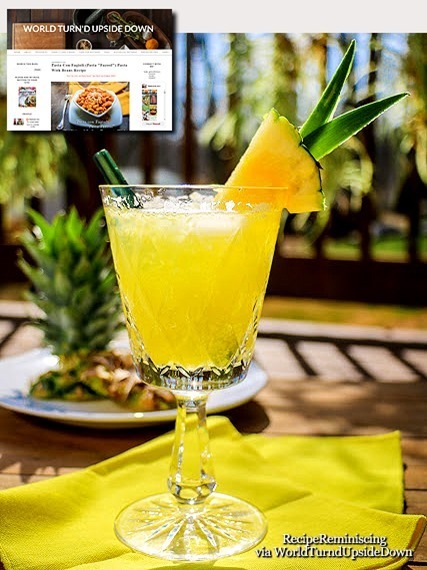 The first large quantity producing pineapple plantation in Florida was started in 1860 by Captain Benjamin Baker, who was probably accustomed to the enjoyment of them at sea. Take Cream a good cupful & put it in a strainer; then take yolks of Eggs & put thereto, & a little milk; then strain it through a strainer into a bowl; then take Sugar enough & put thereto, or else honey for default of Sugar, then color it with Saffron; then take thine coffins & put in the oven empty & and let them be hardened; then take a dish fastened on the Baker’s peel’s end; & pour thine mixture into the dish & from the dish into the coffins & when they do rise well, take them out & serve them forth. 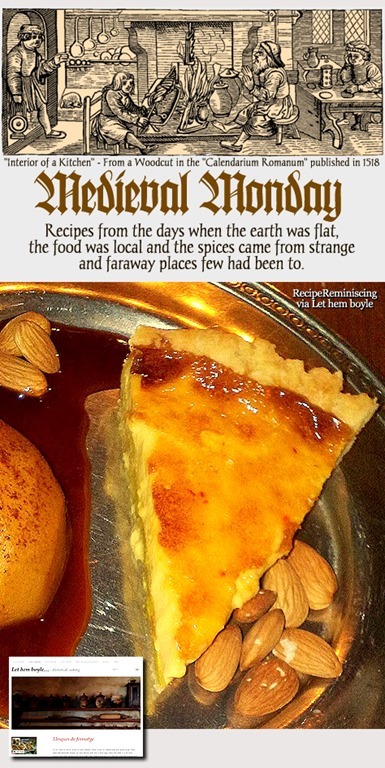 A dessert recipe from the Tudor era found on CookIt! Leach is a kind of milk jelly a little like a blancmange. 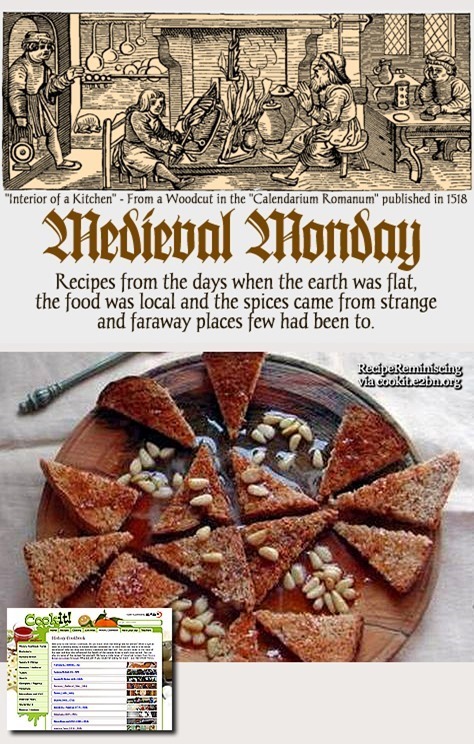 There are milk versions but this one was a dish for Lent when the Tudors would not use milk. Almond milk was used during Lent instead. This is a high table dish for a gentry family and is served attractively. It is time consuming to make requiring setting time and a swift hand when turning out.The top half of the leach is coloured with red wine. A historic sweatmeat recipe found on Cook It! A medieval sweetmeat to be eaten at the end of a meal. Sugar was an expensive luxury so honey sweetened foods were popular. The range of imported spices used would still have made this an expensive dish. Galingale is an aromatic spice, a little like ginger, but worth using if you can get it. This dish is not unlike modern honey dishes which you might know, such as baklava. 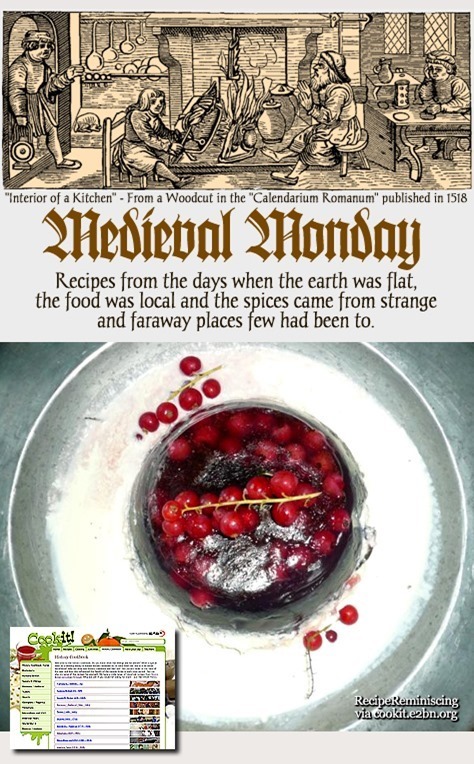 Saara who runs Let Hem Boyle writes on the blog: This blog is all about historical cooking, mainly focusing on the medieval and renaissance periods. I hope you’ll get inspired and see that cooking is fun and easy. The modernized recipes are only my suggestions, so feel free to try out and make your own! This blog and material is in English and in Finnish. Check out the upper bar of this page! You can find all the recipes there 🙂 enjoy! In the liturgical calendar of the Western Christian churches, Ember (Ymber) days are four separate sets of three days within the same week — specifically, the Wednesday, Friday, and Saturday — roughly equidistant in the circuit of the year, that are set aside for fasting and prayer. These days set apart for special prayer and fasting were considered especially suitable for the ordination of clergy. The Ember Days are known in Latin as the quattuor anni tempora (the “four seasons of the year”), or formerly as the jejunia quattuor temporum (“fasts of the four seasons”). The four quarterly periods during which the ember days fall are called the embertides.